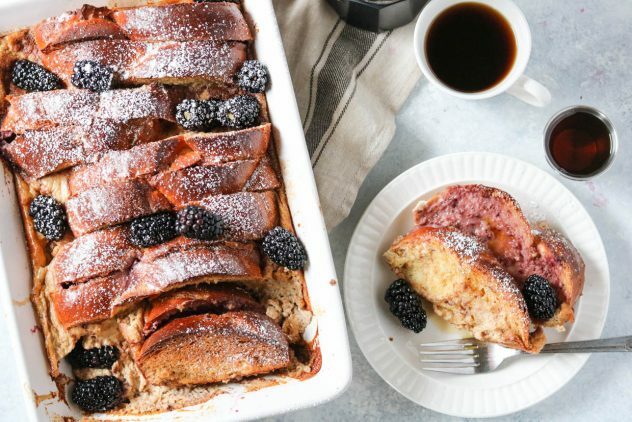 This blackberry marscapone french toast made with challah bread is hands-down to die for! THIS POST CONTAINS AFFILIATE LINKS, WHICH MEANS THAT IF YOU CLICK ON ONE OF THE PRODUCT LINKS BELOW WANDERLUST AND WELLNESS MAY RECEIVE COMPENSATION. If you’ve never made french toast with challah bread before, you’re going to want to run, not walk, to the store and find yourself a loaf. 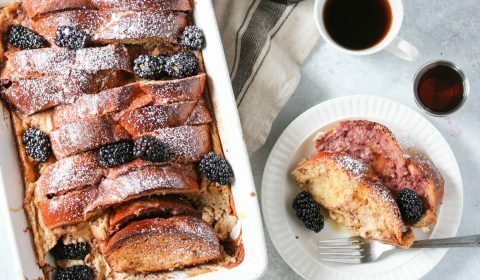 If you’re a bread lover like me, this blackberry marscapone french toast made with challah bread is hands-down the best french toast I’ve ever eaten. The natural eggy texture of the challah bread makes it the perfect choice for french toast. 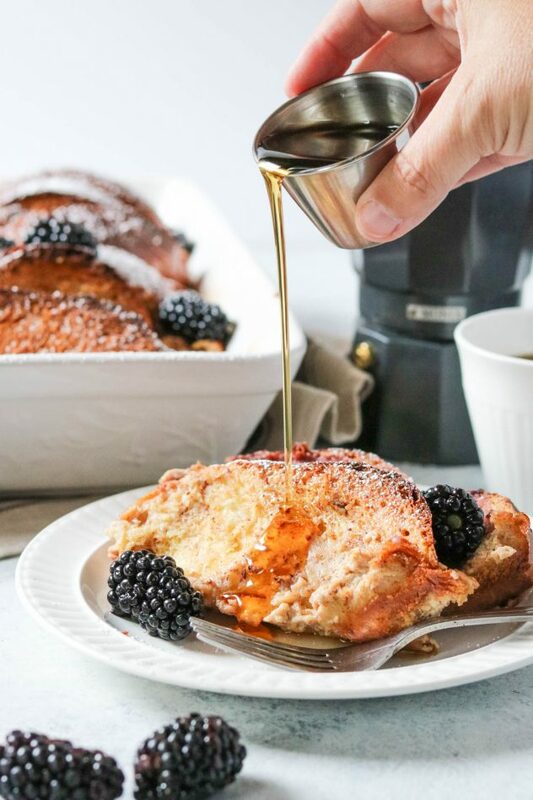 It’s not too thin, so soaking up the liquid isn’t a problem and you don’t end up with soggy french toast like with other french toast casseroles. If you’ve ever been to a diner-style restaurant and tried to order french toast with cream cheese and fruit, the end result is less than stellar, in my opinion. The fruit is usually not fresh at all, covered in gelatin, then topped with a ton of sugary cream cheese. It’s just too much sugar for me. 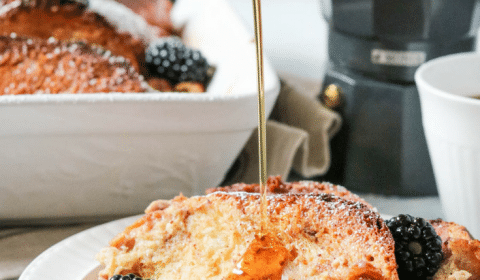 I chose marscapone for this french toast recipe and fresh blackberries and blackberry preserves to bring in a subtle hint of cream and truly fresh berries without the overload of sugar. It’s berry season right now and our blackberry bush is overloaded with plump blackberries. The berries I used in this recipe are actually from our blackberry bush, which is nice to have. If you’re not able to locate a challah loaf at any of your nearby grocery stores, you could most likely use a loaf of brioche bread and get the same results. They’re very similar in taste and texture. I was able to find this challah braided loaf at my local Hy-Vee store. You could call ahead to the bakeries to see if they carry them. I promise you, it’s worth the hunt! 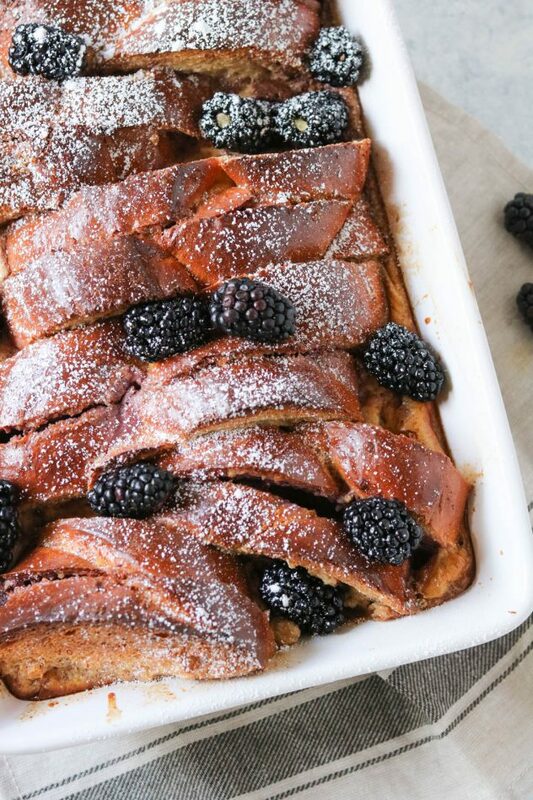 Blackberry marscapone french toast made with challah bread. Preheat oven to 375 degrees F. Grease a 9×13 baking dish with coconut oil or butter. In a small bowl, whip together the blackberry preserves and marscapone cheese. Slice the brioche bread. Take two slices of bread, spread the marscapone blackberry spread onto one slice of bread and sandwich it together with the other slice. Set aside and continue until all of the bread is paired up. In a large bowl, whisk together the heavy cream, eggs, maple syrup, vanilla, and cinnamon. Dip each ‘sandwich’ into the bowl, covering all sides, then place standing upright into the greased 9×13 baking dish. Continue this until all are dipped and into the greased baking dish. Pour the remaining batter over the bread inside the baking dish. Bake for 40 minutes. Remove from oven and let sit for 5 minutes. Dust with powdered sugar and top with fresh blackberries. Serve with maple syrup, if preferred. Jennifer Shreckengost/Wanderlust and Wellness is a participant in the Amazon Services LLC Associates Program, an affiliate advertising program designed to provide a means for sites to earn advertising fees by advertising and linking to Amazon.com.